finally we get good option for will_paginate! A recent change in rails edge make will_paginate rails3 branch not work any more so I switched to kaminari today. It took only half an hour .. awesome plugin! I love your screencasts, thanks a lot ! The only problem I have with kaminari is that you cannot change the parameter used from :page. This means it isn't possible to have multiple paginations on a page. Though, this probably isn't a common problem. I do like it much better than will_paginate though, because it allows its based on scopes, which means you don't get weird errors when trying to apply other scopes on a paginated object like you do will_paginate. Yep, I second that Allen, being able to change the page parameter's name is actually a crucial capability to me that is missing. I need it again and again, so I don't think its so uncommon. But I doubt it is difficult to change Kaminari to support this. Good paginate gem! I love you! Can you create custom paginated collections? Wow, I was just recently looking for an alternative to will_paginate that was compatible with Mongoid. Thanks again for the just-in-time railscast, Ryan! I am bored with will_paginate. So, I decided to use kaminari. This is so awesome. i've reluctantly been using will_paginate but knew it could be done much better with aRel. Thanks for the great cast. I'm switching today. Why this is better than will_paginate? That's a primary function in an application I've built. I wonder if that is something they plan on adding in the future. @ryanb Thank you for introducing Kaminari! @Allen @Nico @Branden Just added that feature and released a new version. Can you try out 0.10.2 gem? Thank you very much @Allen for you cooperation! @Tilo Great tip! I shall write that on my Wiki. I'm sorry I forgot to mention how to. i think kaminari has to much views. i have build my own paginator, that not need so much views. it use only ul/li's with good css class for styling or hidding. a groupby result is not paginatable, because the result is a key value response. Akira Matsuda and Ryan, thanx guys!! Hi there, did you get kaminari to work with meta_search results? Could you update your gem and try again? does it work with datamapper? nice) it works on my site! Adding kaminari to my Gemfile has stopped pickle steps being recognised by cucumber. Anyone else noticed this? Small gotcha if anyone gets caught up on this...if you are attempting to paginate an ActiveRecord relation that has had the includes method called on it, and you include another table with a column name that is the same as the table you're paginating (like created_at), and you're trying to order on that column, kaminari can't figure it out. #fail i used this gem and nothing return all objects exist in my database! Since you have Railscasts for JanRain or OpenID Selector, would you like to add that to the log in system here? I wonder why some users show up with their user name, but some as "/users/123"... is it something with the field name...? The only problem I found is that params[:page] is not set to 1 for page one and defaults to nil. No application.js hooks needed, with unobtrusive JS, since any link with data-remote already has a .live() hook attached to it. Anyone got this working on Mongoid? I only get error messages. 1 for 0 argument error when I try to pass anything on page. per method doesn't work claiming something about can't assign per to fixnum 1. What if your data is obtained from an API (going through net), not from your own DB... then how do you use Kaminari (or will_paginate) ? I am using Kaminari to paginate the display of messages from a database of email messages. In my Show view for an individual message I want to add Next and Previous message links that navigate to the next and previous messages in the list of messages shown on the Kaminari-paginated page. I can't figure out how, from the Show view, to access the array of records that are displayed on a particular page. The message IDs are not necessarily consecutive. The Search results are stored in @messages but I can't access that from the Show view. How can I access the array of 25 messages for a page using params[:page]? Great tutorial, I tried out this gem and quite suprised how easy it is. However I don't I will use it yet as will_paginate is having great meta_search integration that few of my projecst are heavily based. Besides, will_paginate is going improvement to support rails3 simple scope style API, wait and see. And Rails will automatically rewrite your URLs to be SEO-friendly! Instead of /products?page=32, you'll have a nicer URL - /products/page/32. Because of this, you can also leverage on some page-caching techniques if your index isn't updated frequently. By the way, will_paginate has now been updated for Rails 3! but doesn't seem to work anyway. How do you change them ? what the kaminari corresponding of page_entries_info? I use it with will_paginate but I didn't find it in kaminari. I know this thread is a bit old, but I was wondering if anyone has tried to pass the page param through a link to the show page. Say I have a paginated list of users and I click on the show link for a particular user to see the info for that user, OK. HOWEVER, when I click the "Back" link it just does the index page from the start, instead of the "page" that it was on. So, I am not sure how to go about passing the page param back and forth between the show page and the index page. So, how did you accomplish that? Suppose my data is date based. (Like events on a calendar), and I want my "pages" to correspond to some units of time. For example, some number of weeks. So that page 1 is events occurring in next 2 weeks from today... and Page 2 is events occurring in the next 2 weeks.... etc. In this case, a page isn't a fixed number of items. It may be many or few. In this use case, is pagination via kaminari something I should be using, or should I be hacking together something specific to my scenario? And if so, does anyone have any pointers to where to go for advice? tl;dr: I figured it out. Thanks! i am using :window=>1 for my pagination. by this i'm able to sho only 2 pages i.e. 1,2 when user 1st time see, but i want to show here 1,2,3..... using window =>1. How can i show 3 page when 1st time user see the page. I have put gem 'kaminari' in my gemfile. Just wanted to say, thanks for this. Been able to change the html saved my A$$. I wrote this cute pagination style and regular markup(alas will_p) wasn't gonna cut it. I have my root to "entries#index"
When I paginate entries with <%= paginate @entries %> visiting the root (/), the pages links goes to /entries?page=N instead to root as /?page=N. How would I tell kaminari to do that? 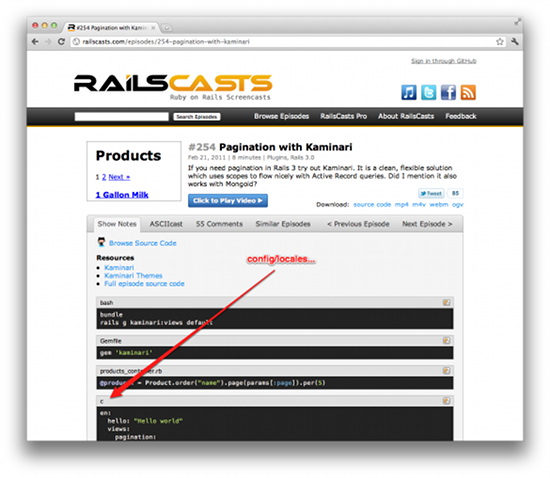 so years later in rails 4, is Kaminari still better, cleaner, and frequently updated as will_paginate? Kaminari seems to not have the prev_span_tag and the prev_span files. It uses certain methods to reference the partials but the ones for disabled ones are missing. So how do we create a method to reference a custom disabled partial we make from scratch? can you help me config action view from 1 2 3 4 5 to default 10 number (1 2 3 4 5 6 7 8 9 10)?